Having sealed the series with a comprehensive win in the second T20I at Lucknow, the home team would look to give reserve bench players an opportunity to perform. India will be aiming to complete a clean sweep when they take on a battered West Indies in the third T20 International at Chennai on November 11 even while looking to test the bench strength. For the cricket loving fans in Chennai, they will certainly miss their 'favourite son' Mahendra Singh Dhoni, who is not a part of the T20 squad. 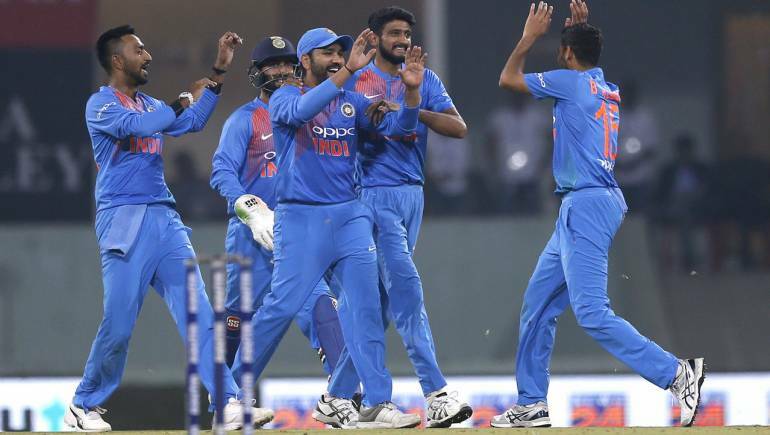 Having sealed the series with a comprehensive win in the second T20I at Lucknow riding on skipper Rohit Sharma's brilliant ton, the home team would look to give reserve bench players like Shreyas Iyer, MS Washington Sundar and the uncapped Shahbaz Nadeem an opportunity before it embarks on the tour of Australia. The selectors decided to rest pacemen Jasprit Bumrah, Umesh Yadav and wrist spinner Kuldeep Yadav for Sunday's game, to allow them to be in the best physical condition ahead of the tour to Australia. Medium-pacer Siddarth Kaul has been added to the squad. The pitch at Chepauk has been on the slower side in recent games but the square prepared for Sunday's game is expected to favour the batsmen. Skipper Rohit was at his best during the Lucknow T20I following up his exploits in the preceding ODI series but the other batsmen haven't made sizeable contributions despite facing an inconsistent West Indies attack. The captain's opening partner Shikhar Dhawan, K L Rahul and Rishabh Pant among others would like to have a few more runs under the belt before the Australia tour. Local star Dinesh Karthik, whose heroics in the Nidahas Trophy finale in Sri Lanka are still fresh in memory, shone as India chased down a modest target in the first match after a mid-innings wobble and will be eager to shine in front of the home crowd. With Bumrah and Kuldeep, who have posed a challenge to the visiting batsmen being rested, Bhuvneshwar Kumar and the young Khaleel Ahmed will be expected to form the pace attack and provide early wickets. The spin department may see the return of Yuzvendra Chahal in the absence of Kuldeep while Krunal Pandya will expect to build on an impressive start to his international career. It remains to be seen if the team management chooses to give Chennai man Washington Sundar a go alongside Shreyas Iyer. The visitors, on the other hand have been at sixes and sevens in the T20s after posing an unexpected challenge to the Indians in the ODIs, especially against the skills of Bumrah and Kuldeep. The absence of regular openers (Chris Gayle and Evin Lewis) and the decision to tinker with the combination at the top hasn't helped their cause either. Skipper Carlos Brathwaite admitted they had to make do with the resources available and the team will aim to end the series with a consolation win. Established names like Kieron Pollard, Darren Bravo and Denesh Ramdin haven't fired and the impressive Shimron Hetmyer pushed up the order hasn't found the going easy to add to the Windies' woes. Among the bowlers, Oshane Thomas has impressed the most with his pace and ability to take wickets but has lacked support from the others. Brathwaite, who rose to fame after smashing Ben Stokes for four sixes in the final over of the 2016 ICC World T20 final in Kolkata, will be eager to showcase his abilities and thereby inspire his men, low on morale, to raise their game against a dominant Indian side in the concluding match of the tour to secure a consolation win. India: Rohit Sharma (captain), Shikhar Dhawan, KL Rahul, Dinesh Karthik (wicket-keeper), Manish Pandey, Shreyas Iyer, Rishabh Pant (wicket-keeper), Krunal Pandya, Washington Sundar, Yuzvendra Chahal, Bhuvneshwar Kumar, Khaleel Ahmed, Shahbaz Nadeem, Siddarth Kaul.